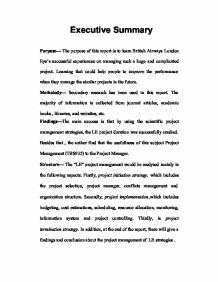 Executive Summary Purpose- The purpose of this report is to learn British Airways London Eye's successful experiences on managing such a huge and complicated project. Learning that could help people to improve the performance when they manage the similar projects in the future. 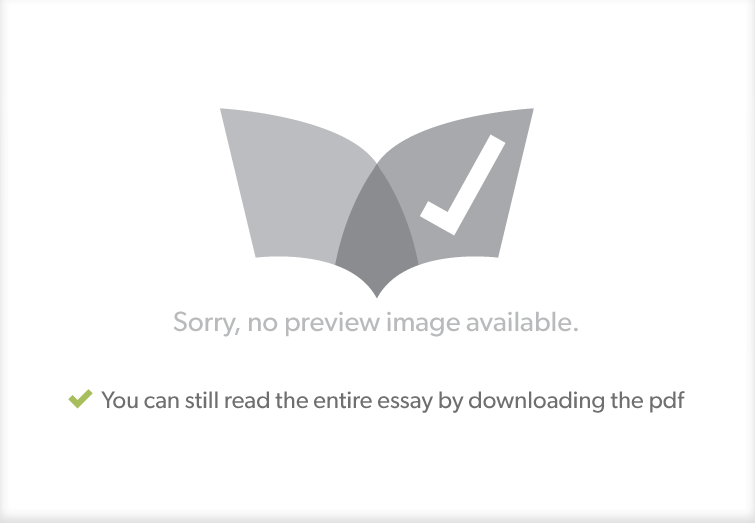 Metholody- Secondary research has been used in this report. The majority of information is collected from journal articles, academic books , libraries, and websites, etc. Findings-The main success is that by using the scientific project management strategies, the LE project duration was successfully crashed. Besides that , the author find that the usefullness of this subject Project Management (TBS935) to the Project Manager. Structure- The "LE" project management would be analysed mainly in the following aspects: Firstly, project initiation strategy, which includes the project selection, project manager, conflicts management and organization structure. Secondly, project implementation,which includes budgeting, cost estimations, scheduling, resource allocation, monitoring, information system and project controlling. Thirdly, is project termination strategy. In addition, at the end of the report, there will give a findings and conclusion about the project management of LE strategies . Table of Contents 1. Project Background 1 2. Project Initiation Strategy 2 2.1ProjectSelection .......................................................2 2.2 Project Manager 3 2.3ConflictsManagement................................................4 2.4OrganizationStructure.............................................5. 3. Project Implementation strategies 6 3.1 Budgeting 7 3.2 Cost Estimations 7 3.3 Scheduling 8 3.4 Resource Allocation 9 3.5 Monitoring 11 3.6 Information system 12 3.7 Project control 14 4. Project termination strategy 15 5.Findings.....................................................................16 6. Conclusion 18 Reference List 19 1. Project Background The British Airways LE, also known as the millinuim, which was designed by David Marks and Julia Barfield, the husband and wife team of architects, is one of the tallest structures in London (2008). In addition, it is also the world's largest observation wheel with a diameter of 135 metres(450feets) and 1600 tonnes, which carried 32 capsules of up to 25 people on a half-hour continuous ride above London (2009). ...read more. (Meredith & Mantel, 2009, p.333). The project was established to celebrate the millunium and Prime Minister would open it, so it is a "design-time" project. However, the project was so huge and complication, which comprised the wheel structure, thirty-two passenger capsules, the boarding platform, associated river works and the landscaping of the adjacent Jubilee Gardens ( The specific time schedule sees Table 1). Duration of project 16 months Specific timetable Solvingdesigning problems The first two months Solving technical problems The next two months Project Starting 11/01/1999 completion 31/12/1999 Table 1: The duration of project (2000) It was clearly to see according to the above schedule that it was very difficult to co-ordinate so many different processes and contractors within that timescale. In this situation, using the old manual methods of scheduling is almost impossible. Mace chose Asta Powerproject, a professional project management tool that is well-proven in the construction industry (2006). By using Asta Powerproject, LE project schedule could show the actual dates for every major milestone of the project. This schedule illustrated dates for every major element and created a guide function for the project. In conclusion, Mace chose Asta Powerproject as the new methods of scheduling, it helped to complete the complicated project in the fixed time. 3.4 Resource Allocation "Resource allocation is the best economic and productive method to allocate the resources for the project" (Meredith & Mantel, 2009, p.383). The resource includes equipment, person, tool, capital, labor and service, beside that, time is a kind of important resource. LE is one of the most imaginative projects ever seen. It must refer to many types of labor, specific facilities, capital and time. In other words , there should involve a great number of assets. * The capital allocation: In this case, the final cost was approx 75 million pounds. According to the collected information, the capital had been mainly allocated into four main aspects, which include designing, technology, construction and controlling (Wang & Mann, 2003, p.5). ...read more. Secondly, project implementation,which includes budgeting, cost estimations, scheduling, resource allocation, monitoring, information system and project controlling. Thirdly, is project termination strategy. From all above, it can be seen that although some political delays and technical problems influenced the project, in general speaking, LE was a successful project. Firstly, its objectives have fully achieved. LE had done an excellent job on performance, cost and time. Secondly, The Project Manager and operating team had played an important role in the process of carrying out the project. In addition to that, using the successful project management strategies helped the project to solve conflicts, effectively allocating the scarce resource and ensured the quality of the project. Reference Asta, 2006, Mace uses Asta Powerproject to build the London Eye, accessed06/08/2010, www.astaweb.com. BA, 2009, �12.5m investment sees The London Eye looking to the future, accessed11/08/2010 www.ba-londoneye.com. Mace, 2000, BA London Eye,accessed11/08/2010 http://www.macegroup.com/projects/project-library/ba-london-eye. Mann, AP, Thompson, N, Smits, M, 2001, 'Building the British Airways London Eye' Proceeding of ICE,pp.60-72. Meredith, JR & Mantel Jr, SJ 2009, Project management, 7thedn, Wiley & Sons, USA. Li, 2000 'Case Study: British Airways London Eye' , Fairield Control System, vol3, no1,pp.1-4 London Eye, 2009, Risk assessment for The London Eye River Cruise, accessed 08/08/2010,http://www.londoneye.com/. LondonEye, 2006, London Eye, accessed 06/08/2010. http://en.wikipedia.org/wiki/London_Eye. London Eye, 2007, British Airways London Eye - the people behind the project, accessed06/08/2010, www.design-technology.info/.../Engineering-London-Eye-press_pack.pdf. London Eye, 2008, British Airways London Eye, accessed03/08/2010, www.answers.com/topic/london-eye. London Eye, 2009, Making of The Merlin Entertainments London Eye, accessed03/08/2010, http://www.londoneye.com/ExploreTheLondonEye/MakingTheLondonEye/Default.aspx. Parrish, B 2009, Monitoring and Information Systems, lecture, TBS935, Project Management, University of Wollongong, delivered 24 September. Parrish, B 2009, Project Control, lecture, TBS935, Project Management, University of Wollongong, delivered 8 October. RPMA, 2000, "LONDON EYE"; The World's Largest Observation Wheel. Design and Construction of the Monitoring System of the Cables Tension Variations, accessed06/08/2010, http://www.ndt.net/article/wcndt00/papers/idn376/idn376.htm Sadoc, H 2005, The London Eye, accessed06/08/2010 http://british-airways-london-eye.visit-london-england.com/ Wang, YC & Mann, A 2003, 'Construction of the British Airways London Eye,Building Structures, vol.5, no.1, pp.1-10. Williams, E 2010, Edenaire controls climate for London Eye, accessed06/08/2010. http://www.eaton-williams.com/edenaire/casestudies/edenaire_casestudy_londoneye.php. ...read more. This student written piece of work is one of many that can be found in our GCSE Work experience reports section. This shows what the book calls animistic thinking. According to the book, this kind of thinking is the belief that inanimate objects are alive. Another form of animistic thinking would be when my mother told a story about a leprechaun. Soft Wood: Soft wood mainly comes from evergreen or conifer trees (right). They also come from trees like pine, cedar, fir, hemlock, spruce, yew and redwood. Softwoods are mainly softer than hardwoods; however there are some exceptions i.e. yews are much harder than hardwoods. Proposed Outcomes By the end of this project I hope to have examined all my vices and virtues and produce evidence about these strengths and weaknesses. I hope to find out which of my strengths are useful when looking and jobs and which weaknesses rule out which jobs. Despite my conservative family, I was fortunate to have the best teachers encouraging me to pursue my own dreams and my own path. One of those teachers is Mr. Briber, a physics teacher of my freshman class. I ended up outside the staff room for the entire break. Just before the bell rang she came out and told me I needed money to buy meal tickets, that I will be following an English teacher, and that I should just walk into the building and find the nearest adult. In the afternoon I met Mike Turner again and took pictures of cells with his microscope camera. Although he was enthusiastic about the cells I didn't find them that interesting and just pretended to like the pictures I took. Discuss the importance of children making choices in their play. This activity is for children aged 3 or 4. It will help to develop their hand and eye co ? ordination skills, whilst making their jewellery, threading the string through the pasta. It helps develop their fine motor skills. It helps with their social development because they are working with other children and learning how to take turns. Looking for expert help with your Work experience reports work?